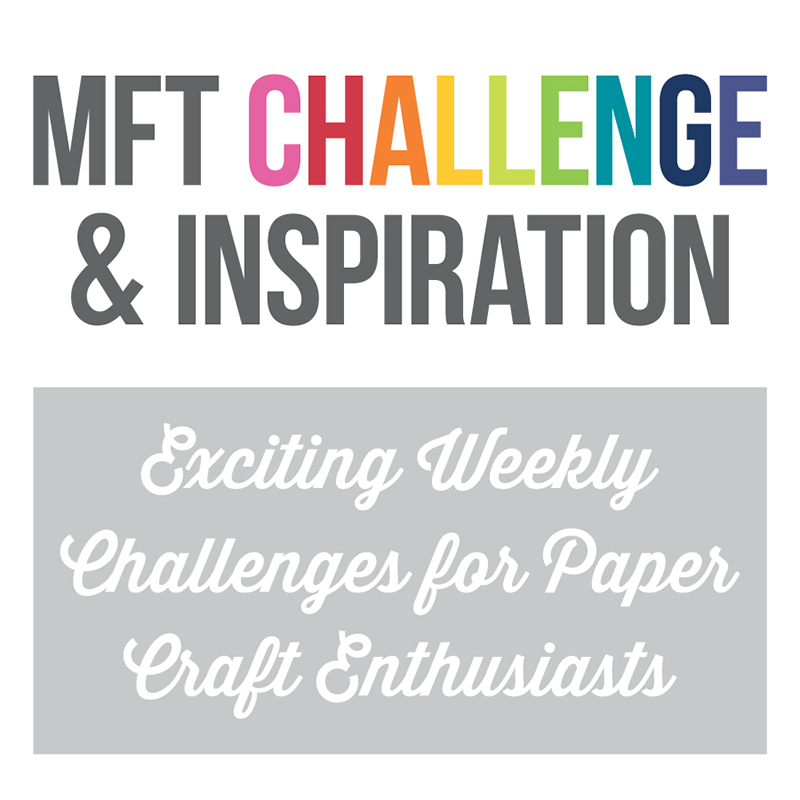 Stamping A Latte: MFT & MISTI! I am delighted to be participating in a collaboration with my beloved My Favorite Things and the amazing MISTI! I am SO excited!! I, literally, ONLY use a MISTI to stamp. I recently moved my stamp room to a different room and reorganized all of my supplies. I didn’t even MOVE my stamping blocks to my new room! I just do not use them, ever! It is truly a revolutionary tool! I had a lot of fun creating my card! I’ve used the new Pure Innocence So Much Love, Pure Innocence So Much Love Die-namics and the new Scattered Hearts Background! SWOON! I began with a panel of Smooth White Card Stock cut using the A2 Rectangle STAX 2 Die-namics, and using one of my MISTI tools (yes, plural, I actually have THREE! ), I stamped the background using the Scattered Hearts Background. 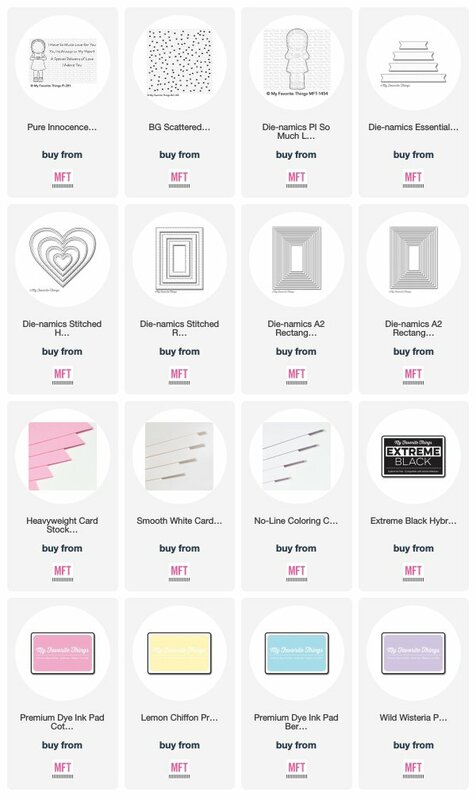 I have this MISTI set up for backgrounds (blue MISTI stickers so I know it’s the one for backgrounds), and I love the convenience! I stamped the Scattered Hearts Background stamps using one color at a time. I began with Cotton Candy Premium Dye Ink, then Lemon Chiffon Premium Dye Ink, Berrylicous Premium Dye Ink, and finally Wild Wisteria Premium Dye Ink. Because you can stamp the same stamp repeatedly, and be assured perfect placement, it was a breeze to stamp all of these colors. I love how they blended to created what looks like six different colors! Once the background was stamped, I added a panel of Smooth White Card Stock cut using the Stitched Rectangle Frames Die-namics, and I popped it up with foam tape. LOVE. I then added a heart of Cotton Candy Card Stock (gosh, I love this color!) cut using the Stitched Heart STAX Die-namics. Next up, I cut this little cutie from No-Line Coloring Card Stock using the new Pure Innocence So Much Love Die-namics, and using my MISTI, I stamped her with Extreme Black Hybrid Ink using the Pure Innocence So Much Love set. I always first stamp my image onto my MISTI paper, cut out the image with my Die-namics, and then lay the negative frame on top of the stamped image. 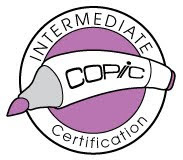 I then insert the die-cut and re-stamp my image. PERFECT stamp image, EVERY.SINGLE.TIME. Once she was stamped, I colored her with Copic Markers, and then added her to the card, popping her up with foam tape. I then cut the sentiment panel from Smooth White Card Stock using the Essential Fishtail Sentiment Strips, and stamped, using my MISTI, the sentiment “I Adore You”, using Extreme Black Hybrid Ink. I finished off the card with a trio of enamel dots. 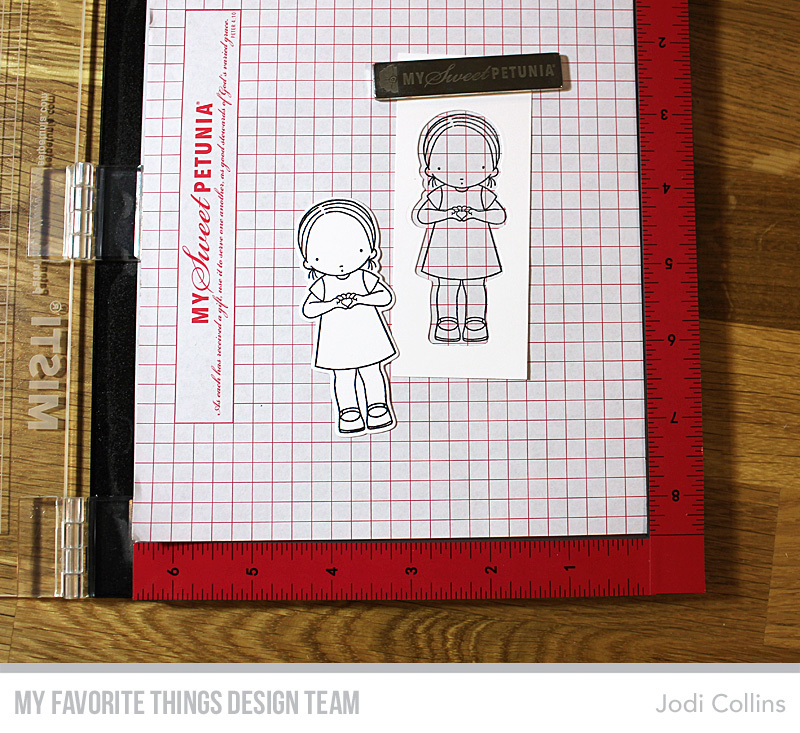 Oh yes, my third MISTI, well it’s the mini, and I have it set up with stamps to stamp the back of all my cards. LOVE! Thanks SO much for stopping by! 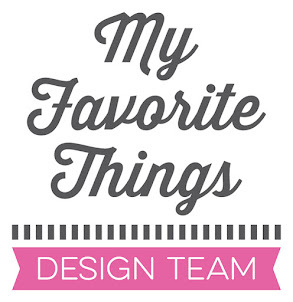 Please head over to the MFT Blog to check out what the rest of the team has created, and for a chance at PRIZES!!!! MFT will be giving away three $50 My Sweet Petunia Gift Certificates, and My Sweet Petunia will be giving away three $50 MFT Gift Certificates! 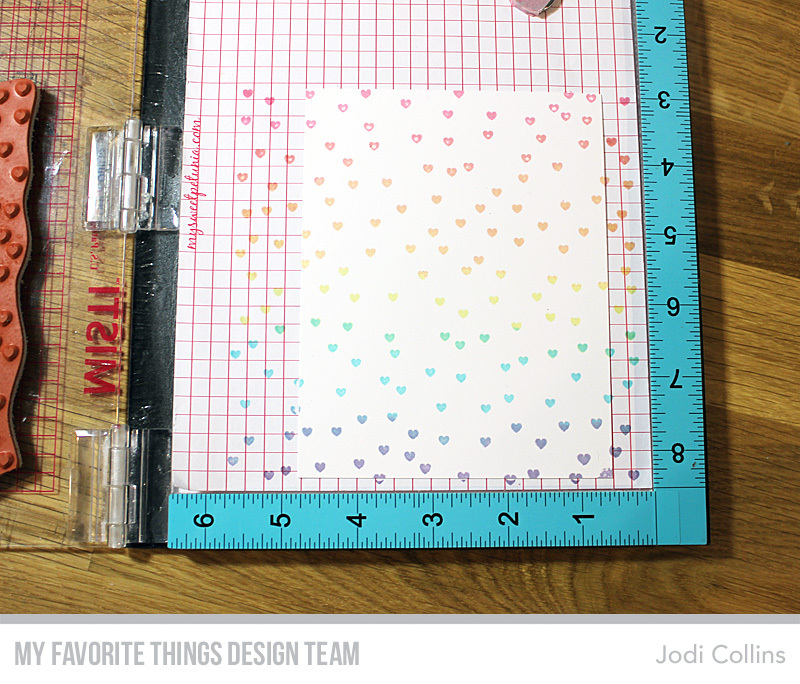 Hi Jodi, I just love using the Misti to make background paper and, I love your little heart background. The Sweet Innocence girls are super cute. Your card is so sweet. Thank you for sharing. What a darling card! The background is wonderful! I so need a Misti! Really adorable card, the background is so sweet. The Misti makes such a difference, I love mine! How sweet!! Great idea doing a background that way. Love the many colors of hearts! Oh my goodness...I really love the rainbow background you created. It's the perfect backdrop for this sweet girl! OMG! I love the little hearts background you made! TOO CUTE! Your card is so sweet and fresh! 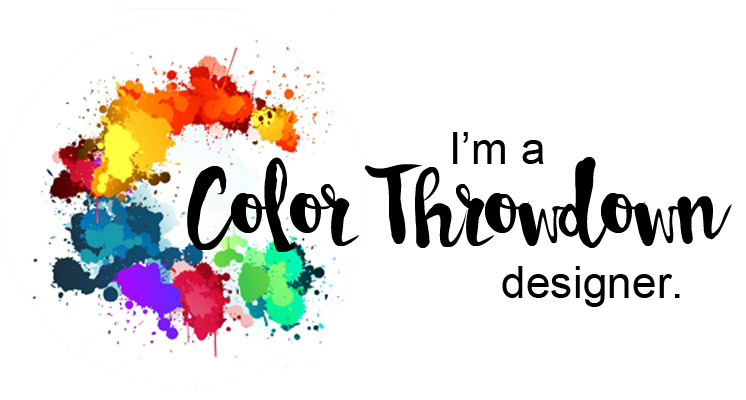 I love your coloring technique too! Beautiful! Love your darling card. And love the Misti. Oh what a darling card! Love the softly colored falling hearts and the frame is a perfect touch. Love your sweet rainbow hearts. Fun rainbow heart background and the image is so sweet. That little girl is precious!!! Your card is adorable! Thank you for explaining everything so clearly! I have the large MISTI, but I do plan on ordering others! Very nice card, love the detailed coloring. Great card, love the multi-colored heart background I did order that bkgrd stamp, looking forward to using it. Looks like we use the Misti the same way- can't do w/o it any more. Your card is so sweet, & yes, I love the frame! Your heart background is fabulous!! 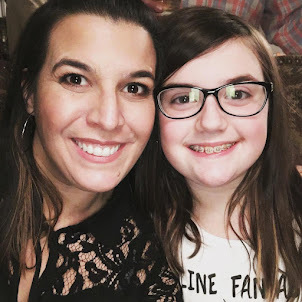 I received the Mini Misti for Christmas and didn't realize what I was missing. I sold most of my blocks online and I don't miss them!! Love the rainbow background! Very cute card. Your coloring of the girl and her dress--wonderful as usual!! Love your tip on getting a perfect die cut image - this is so useful for dies that are solid where you can't see the image - will try this one soon! So sweet. I like the framing and the colorful hearts.